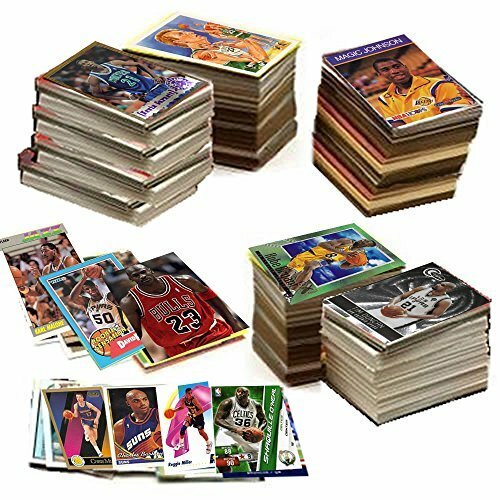 This is a collection of over 600 basketball cards spanning three decades of basketball card history! The collection is placed in a brand new white box perfect for gift giving which protects and preserves each card in the collection. Look for rookie cards, hall-of-famers, superstars, special inserts, and more. In this collection are cards from manufacturers such as Topps, Upper Deck, Hoops, Skybox, Stadium Club, Panini and many more. As a bonus EVERY collection contains one unopened vintage pack of basketball cards that is at least 20 years old. In the collection you'll look for cards of players such as Allen Iverson, Chris Webber, Dominique Wilkins, Dwyane Wade, Gary Payton, Julius Erving, Kevin Johnson, Michael Jordan, Steve Nash, Tim Duncan, Tracy McGrady, Alonzo Mourning, Antoine Walker, Charles Barkley, David Robinson, Dennis Rodman, Isiah Thomas, Kobe Bryant, Larry Bird, Lenny Wilkens, Ray Allen, Vince Carter, Clyde Drexler, Hakeem Olajuwon, Joe Dumars, John Stockton, LeBron James, Magic Johnson, Moses Malone, Robert Parish, Tim Hardaway, Dennis Johnson, Grant Hill, James Worthy, Jason Kidd, Karl Malone, Kevin Garnett, Patrick Ewing, Scottie Pippen, Shaquille O'Neal, and many more. The cards vary in each 600 count collection. An order of one or more will get you an impressive variety each and every time. This is the perfect assortment for the beginning collector and an excellent addition to any collection. These basketball card collections are a blast to go through. You will never know what you will find. This is a collector's dream come true! If you have any questions about this product by Topps, Upper deck, Donruss, Fleer, Score, Upperdeck, contact us by completing and submitting the form below. If you are looking for a specif part number, please include it with your message. 2017/18 Panini Contenders Draft Picks Basketball Factory Sealed Retail Box with AUTOGRAPH! Look for Rookies & Autographs of Lonzo Ball, Markell Fultz, De’Aaron Fox, Jayson Tatum & Many More! WOWZZER! 2016 2017 Donruss NBA Basketball Series Unopened Blaster Box of Packs Featuring One AUTOGRAPH or MEMORABILIA Card Per Box! !